According to the information published by the General Administration of Quality Supervision, Inspection and Quarantine of the People's Republic of China (AQSIQ), there are 261 batches imported food returned or destroyed by China CIQ on August 2014. The majority of the rejected products were mainly imported from Taiwan, French, Germany, Vietnam, USA, Malaysia and Thailand. The total weight was about 8808 tons. Pleases refer to the following 2 figures for detailed information. 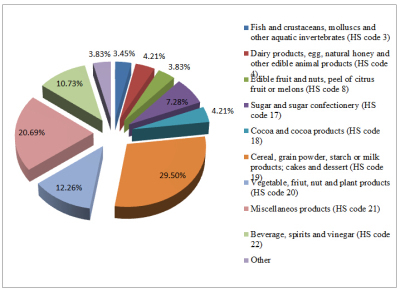 Half of these rejected imported foods belong to the categories of cereal, grain flours, starch or milk products, cakes and dessert (HS code 19) and miscellaneos products (HS code 21). They occupy 29.5% (HS code 19) and 20.69% (HS code 21) of the total weight of rejected imported food, respectively. Figure 2 shows that there are mainly 8 kinds of rejection reasons. 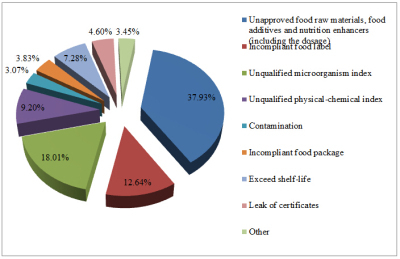 For incompliant imported food on August 2014, most of them were rejected for the use of unapproved ingredients, including food raw materials, food additives and nutrition enhancers (37.93%). Moreover, the incompliant food label (12.64%) and unqualified microorganism index (18.01%) were also the important reasons for rejection. Information about how to export prepackaged food into Chinese market compliantly can be found here. If you would like to get more information, please send us an email.